5-Year-Old Confirmed Dead In Crash That Injured Four In An Interstate 95 Crash | Schuler, Halvorson, Weisser, Zoeller & Overbeck P.A. A five-year-old child was killed, while three other family members were injured in a rollover crash on I-95 in Palm Beach. 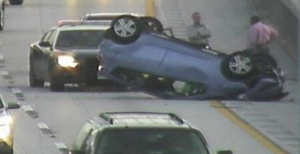 The accident happened in the northbound lanes of I-95, about a mile from the Palm Beach exit. The Florida Highway Patrol said, a 16-year-old boy, behind the wheel of a Honda S2000, hit the rear of a Mercury Mountaineer carrying a family of four. On impact the Mercury had spun and overturned, coming to rest on the shoulder. As the Mercury rolled its windshield shattered and a tire came off. The driver of the Mercury, a 39-year-old man and a 31-year-old woman, along with their children, five year old Carlos and two month old Jasmine, were all taken to Broward Health Medical Center. Doctors were unable to save the 5-year-old boy. The infant was listed in critical condition. Both parents suffered minor injuries. “We do know there was some child restraint seats that were in the vehicle, but we are trying to determine if they were utilized and if they were utilized properly,” said a Florida Highway Patrol officer. The crash shutdown northbound I-95 for five hours as investigators worked on the scene. The road has since re-opened.